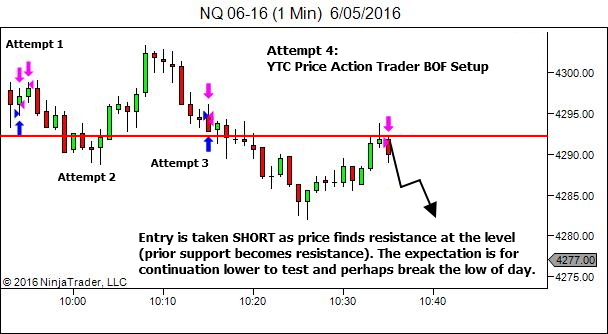 Our progress as we develop as a trader rarely occurs in a uniform, straight-line manner. From time to time our development stalls, awaiting some trigger that shifts our perspective and allows us to see the game in a whole new way. 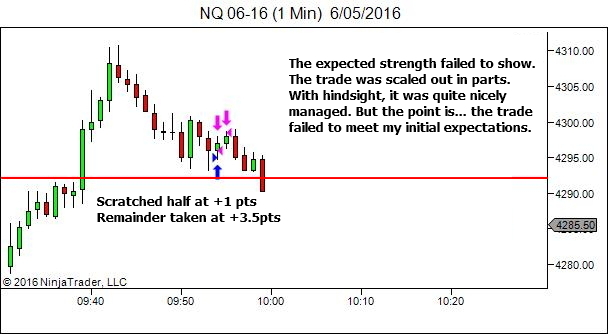 Most of my trade ideas fail to achieve the expected outcome! 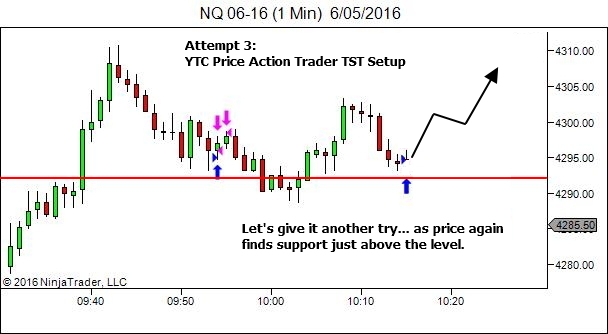 Three failed trade ideas… although the two that filled were managed well. And only ONE trade that went according to plan. Becoming a trader requires that you stop expecting perfection. Becoming a trader requires that you learn to manage the periods of imperfection. Stop expecting perfection. Learn to manage the imperfection. PS. 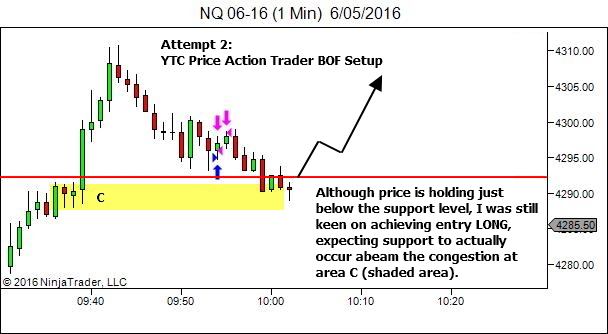 See here for more on trading the BOF and TST setup areas. What a post !! So refreshing to come back to this blog every time. It’s always a nervous wait after I hit “Publish”. I never know how a post will be received. It’s awesome to get some positive feedback! Thanks Mohamed! 🙂 Glad you enjoyed it. Thanks for the Golden nugget! You’re welcome Rinchen! 🙂 I’m glad you enjoyed the post. In the above examples your time frames are 1 min and 15 seconds. 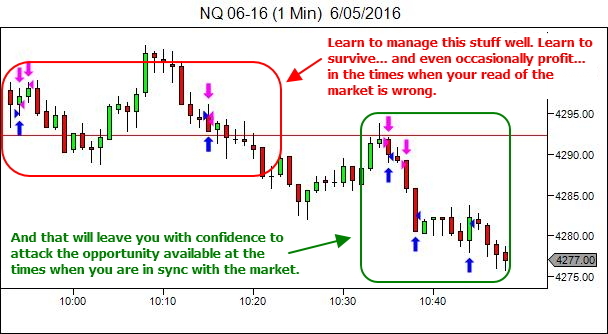 Can the same be applied to 3 min and 1 min timeframe? Mahesh, Yes absolutely. Almost everything I discuss is scalable to higher timeframes. 3/1 or even higher. In the first example, after the strong break out and slow grinding pullback, and then the bullish candle A and the low rejecting candle B, choice was only for long. Even in hindsight, i cant see anything different in that. So am i missing something or is it the way market is — unpredictable? It’s not about predicting. It’s about reacting. We identify places we want to trade. Places that should provide a positive expectancy, over a large sample of results, if we take the trades in that area. Entering LONG at this time and place was the EXACT RIGHT thing to do. Had it rallied strongly from here, there was good multiple-R profit potential. But price didn’t follow through in any way that I expected. So I scratched. This game is not about finding winners. It’s about managing risk and opportunity over a large sample of trades, in order to profit over the full sample. Thank you Lance for you replies. That explains a lot. And must tell you that I am a big fan of your trading style. In the same example, this refers to the first entry that you scratched for +1 and +3.5 points. Here, the price was not moving “against” you, it was just that it wasnt moving “Fast” in your direction. I see that you dont even give price “room” of even one candle. Dont you think this causes too many early exits? And does this vary with the instrument you are trading? That one candle is multiple lower timeframe candles. But yes, if it’s not moving how I expect, I’ll reduce size or get out. Please note though that getting out does not mean you can’t get back in. Get flat. Remove the emotion. Reconsider with a clearer mind, with no exposure to risk. If you still like the trade, get back in. But if it subsequently moves to the target without me, who cares? It wasn’t mine to catch. More opportunity is coming. Get ready for it. You don’t have to catch every move. And also would you get back in if new entry happens to be beyond LWP? Of course with R:R in favour. This occurs regardless of the fact that there may still be suitable R:R available. If I miss it, I’ll let it go. There is ALWAYS more opportunity available in future. I agree with everyone here, I really enjoyed the article. In the first entry, There was a good green candle which you missed and after that there was a good retest of support with candle B. My question is , how did you enter at the very low of next candle without even that candle showing enough bullish strength? 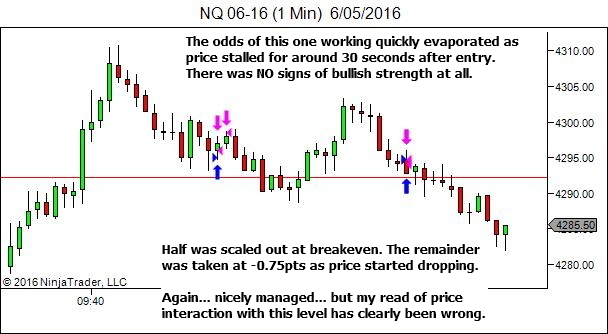 Do you look for even smaller timeframes or you had made up your mid to enter long at this point without even enough proof of strength. 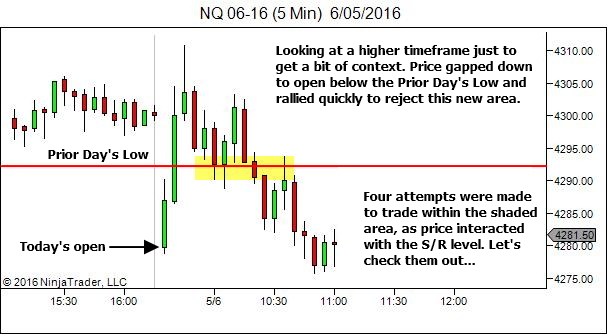 I do look at a lower timeframe, which is not shown in this article. But it’s not relevant anyway. 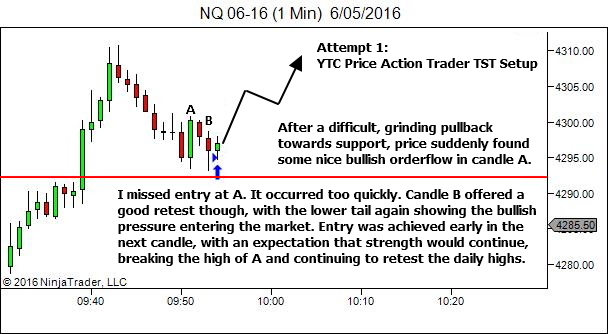 The decision to enter was made as candle B rallied higher into it’s close. The question is then, “how to enter”. Look at the chart and see the amount of overlap between every candle. With lots of overlap it’s reasonable to expect some amount of pullback into the prior candle. 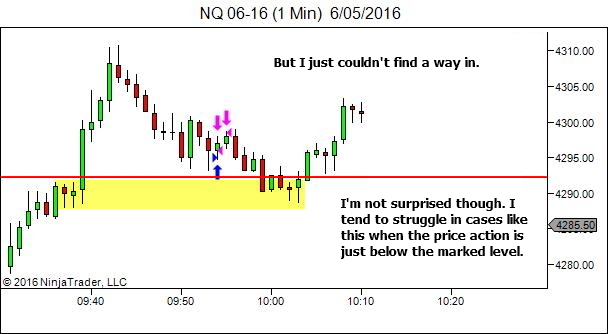 The entry order was a limit order placed slightly lower, only by a tick or two. 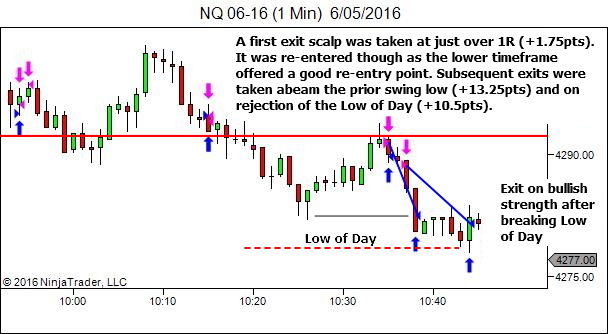 If you can save a few ticks on entry or exit, from time to time, it makes a difference in overall results. You’re welcome Raviraj! 🙂 I’m glad I’m able to help. Leave a Reply to Mahesh.